I’d heard about this project before and as stupid as it was it sounds like it could have actually worked against the highly flammable homes the Japanese lived in. Of course carpet bombing with B-29’s worked pretty good too. I can’t understand why Hollywood hasn’t made this into a movie starring Bill Murry by now. I mean, they turned bats into tiny suicide bombers! The movie would almost write itself. Greenland Fjords with ship tracks in the ice. Last week we found a crack in a rib on the tail of the Grand Caravan we lease to fly jumpers at Skydive Twin Cities. The crack was significant enough that the plane was flown from Wisconsin to Atlanta to get fixed. That left us with no jump ship for the week. But wait, my Cessna 206 N207J “Juliet” was back in operation and ready to go! As I mentioned in the last post my mechanic and I had spent a long time getting Juliet back in the air and one of the things we did was put on 6 new cylinders. Whenever you put new cylinders on an engine they need to be broken in by flying at high power settings while keeping to cylinder head temperatures cool for about 15 hours. Now I can meet these parameters while flying skydivers by keeping my airspeed high on the climb to altitude to keep the engine cool and leaving some power in on the descent but the best way to break in new cylinders is cross country flying. So it was with great sadness and inconvenience that I was forced to fly back and forth to work every day last week. It was a real hardship having to drive 5 minutes to the airport each morning and climb into my airplane for my commute to work. You can’t possibly imagine the drudgery of flying 500 feet over the Wisconsin countryside seeing deer, turkeys, Bald Eagles, and rolling hills pass beneath your wings during the agonizingly long 15 minute flight. It is to weep. Seeing firemen set a grass fire isn’t interesting at all. Ever Koda looks bored on the way home after a long day of begging for treats from the skydivers. When I first opened Skydive Twin Cities I got the meat bombs skydivers up to altitude in 2 Cessna 182’s, 2 Cessna 206’s, and a 1952 De Havilland Beaver. Running 5 planes at once was a big job and keeping enough pilots trained was a nightmare. In our second year a hungover pilot aborted a takeoff and ran one of the 182’s off the end of the runway and onto a road, no one was hurt but the plane’s nose wheel was folded under and the prop, engine and firewall suffered damage. With that incident in mind and being tired of the 5 plane hassle the next year I started leasing a Twin Otter as my main jump ship. I still used the small Cessna’s and the Beaver for loads too small for the Twin Otter but over the years my fleet shrank down to just the two 206 Stationairs. With the Twin Otter taking the bulk of the work I only needed one of the planes operational at a time, so I parked one in a hanger with the intention of getting it flying the next year. That next year was five years ago. When my mechanic and I finally dug the poor neglected 206 out of the back of the hanger it was a sorry sight, covered in a thick layer of dust, the tires a little flat and the interior filled with junk because I’d been using it as storage for all kinds of crap. When we did a compression check we found that two of the cylinders had fairly low compression and needed to be changed and I figured that as long as I was replacing one third of the cylinders I might as well replace them all and call it a top overhaul. The whole project took about two months but last week I was finally able to get my beloved Juliet (from the N number on the tail N207J) back in the air. And seeing that that the cylinders need to be broken in I have no other choice but to fly to work all week. The big ball of fire finally made an appearance in Wisconsin and I somehow managed to fly the Super Grand Caravan up to 14,000 feet and back 30 times without breaking it. 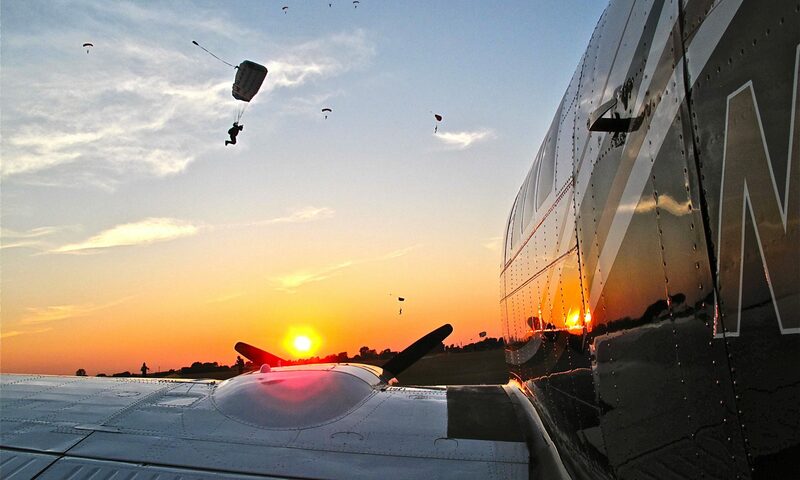 It’s always a challenge to get back into the groove of flying skydivers in a plane that can make the round trip from takeoff to landing in 13 minutes or less. Fly 30 seconds to far down wind and it will take you 2 minutes longer to get back to the spot the jumpers want to exit the plane. 2 minutes doesn’t sound like much but when you are paying $15.00 a minute and flying up to 32 loads a day it adds up. Still beats having a real job though.